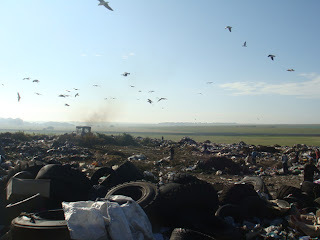 Middelburg municipality contemplates digging a moat to keep waste pickers off the landfill. The moat was used by French kings during dark ages to keep the enemy off their palaces. It is a trench which is about 15 feet wide and deep. Usually the trench is dug next to the water supply so that it becomes easy to fill the moat with water in order to make it impossible for the intruder to cross. The man-made controlled bridge was used to access the palace or the protected town. This was more practiced in ancient times during times of war in Europe. This medieval practice is about to re-emerge in South Africa. The municipality has tried unsuccessfully in the past to keep waste pickers off dumping sites. Fences have been cut, walls have been dismantled by waste pickers in search of the recyclables. 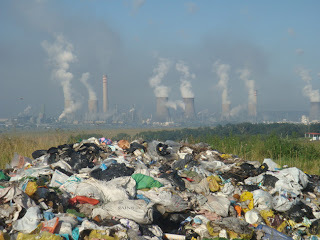 Extra security with police dogs, high walls, and heavily armed security has proven futile in trying to prevent waste recovery at various dumpsites of South Africa. People have even been shot at by municipal security people. Lack of employment opportunities has lead to extreme poverty in most regions in South Africa. Poverty and hunger has encouraged people to engage their minds in finding a way of putting food on the table. Some people have resorted to street trading in towns, some have urbanized, and some have started recycling at various landfills in the country. I really have respect for such people because instead of resorting to crime, they decided to make an honest living. Their biggest enemy is the government that they are always voting into power with a hope of improving their lives but to their disappointment now and again. I cannot stop thinking about what a municipal employee in Middleburg landfill said when I visited three weeks ago. He promised them that since they are problematic to their operations at the dumping site therefore a moat will be erected around the landfill. He uttered these words during the meeting between groundWork, SAWPA and Middelburg waste pickers. Here about 400 waste pickers survive by picking recyclable material at the landfill. Should a moat be erected that means more than 400 people will be on the streets without jobs? Our government needs to rethink their governing tendencies. Otherwise we would witness a poor and working class revolution in South Africa. Waste pickers have vowed that they will try and protect their livelihoods by all means - if it means taking to the streets, let it be, and if it means that the elections have to be boycotted, then let it be. People are “gatvol” of a government who is oppressing them economically and politically. Warning bells have always been ringing in everyone’s ears but for some reason government is not listening. I have witnessed government spending taxpayer’s money in protecting waste at various landfills. I asked myself if this spending is worth it when people are desperately poor in South Africa? Recycling needs to be formalized and waste pickers needs to be assisted instead of being discriminated against by our government. This is a job for so many South Africans. The formal recycling industry exists because of the informal industry which is mostly driven by waste pickers. Collect a Can for example is in the Guinness Book of Records for collecting a million recyclable cans, and who did most of the work at various landfills/dumps for these cans to be recovered? It is the waste pickers, and there is no recognition or prize for waste pickers because they are at the bottom in our social class system. Our government is talking about mitigation of climate change impacts, green economy, green jobs but waste pickers are not seen as people who are contributing positively towards the above policy issues. Our government needs to rethink the way it does things and allow people to come with solutions on the challenges faced by the country.